I was lucky enough to get some time to talk with three time Super Bowl champion Daryl Johnston today. It was quite an honor for a lowly fan like me to have 15 minutes of his time to discuss the Dallas Cowboys. 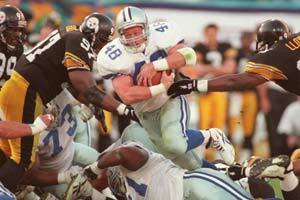 Daryl played for the Dallas Cowboys from 1989-1999. He was the lead blocker for the majority of Emmitt Smith's all time NFL record rushing yards. Daryl currently works for FOX as a color analyst for NFL broadcasts. Any long time fan knows that "Moose" was a fan favorite no matter where the Cowboys were playing. Daryl talked to me in conjunction with his promotion of Bank of America's Cowboys Banking. The program allows you to personalize your debit Mastercard and provides tons of incentives for Dallas Cowboys fans. Be sure to check it out to thank Daryl for giving his fans some of his time. What is your best memory from your games with the Redskins? "Its kind of a mixed bag for me. My initial neck injury came against the Redskins at FedEx Field and then my career ended against the Redskins at FedEx Field. So, not a lot of good memories for me in the rivalry. We did win the only game of 1989 when we went 1-15 that was a victory over the Redskins at RFK. And then one of the other ones that I really enjoyed was probably my favorite game was the opening game of the 1991 season on Monday Night Football. We had Hank Williams, Jr. down in Texas Stadium to sing the song. It was the first time that Texas Stadium was really electric with the atmosphere inside. Even though we lost the game 31-30 I think that gave us a lot of confidence at the start of the season that we could compete with the better teams in the NFL. We went on to have an 11-5 season that year." How about the game in 1999 when you guys came back from 21 points down to win the game? "Yeah, that was a good one. I had forgotten about that one. Yeah 21 points down in the 4th quarter too? That was pretty amazing. It was a situation too because we were really having trouble throwing the football. We actually got back into the game even down 21 by running it. So that was one of the more emotional games we had down the stretch. Things for me were starting to wind down. That's a good game to have in your memory banks at that stage of your career." When you are calling the Cowboys games for FOX do you ever find yourself having trouble pulling for the Cowboys and having to keep yourself level or do you have yourself pretty well separated at this point where that's not an issue anymore? "No, its kind of easy for me. I like to see good football. So, if the teams are playing good football it doesn't matter whether its Dallas, Philadelphia, Washington, Carolina, San Francisco. I like to watch well executed, well coached football. What is frustrating for me is when you see sloppy play, when a team is out of sync. We've had Dallas on a number of occasions where they have not played well. We had Dallas-St. Louis last year. That was a difficult game to be a part of. They went right down the field on the first series and then didn't do much of anything right the rest of the game. You can't tell the viewer something that's not happening on the broadcast. So if Dallas is not playing well it is just me trying to explain why its not happening or what the other team is doing to take advantage of the fact that they are playing well. And that's about all I can do. They either make my job a little bit easier when they are playing well or a little bit more difficult when they don't play well." When you aren't calling the games do you still consider yourself part of the team or the organization? "Part of the family. Part of the Cowboys family. You're not part of the organization. Your not a part of the team. Not from a business sense or from a participation sense but you are always a part of the family. And the Jones family has done a great job of kind of perpetuating that. So you have a lot of great people that you can call part of the family. And a lot of those guys have made the Dallas/Ft. Worth area their home. I get to see Walt Garrison and Roger Staubach and Preston Pearson and Drew Pearson and Randy White and Lee Roy Jordan and all of the guys that came before us. So that's the cool part. You're not part of the organization but you are always part of the family." What do you think about this year's version of the Dallas Cowboys? "Lacking consistency right now. I thought that if they would have won the Green Bay game in convincing fashion then all of a sudden now I think that the New Orleans Saints are the team they have to be concerned about. And they are going to play each other down the stretch in the month of December. The loss to Green Bay just brings everything back after that great victory in Philadelphia. I'd seen Philadelphia the week before against the Giants and I really thought that was one of the best performances I had seen all season, personally. I just was so impressed with Dallas going up there the following week and playing as well as they did that the game in Green Bay should have been a lock. Green Bay had lost to Tampa Bay, they had a players only meeting. Those are signs of a team in desperate straits. Dallas should have been able to come out and finish those guys off." Do you think the team has enough talent to compete for a Super Bowl or do you think there is a talent issue and that is part of the problem? "No, I don't think there is a talent issue. I really don't. You look at the key components you have to have to be successful. The NFL is a quarterback driven league. They have a quarterback who admits that he has some things that he has to improve on with his game. I think he has been a lot better with his decision making this year. You need big playmakers. They've got Roy Williams, Miles Austin, Jason Witten, Felix Jones, Marion Barber. You need a defensive presence that can get to the quarterback. They have Demarcus Ware. They have Anthony Spencer. Bradie James is good from the inside. They've got some good tackles to hold down that foundation. To me they've got all the components. I don't think there's any lock down corners in the NFL. But when you look at Dallas with Mike Jenkins, Orlando Scandrick and Terence Newman that's a pretty good trio of corners that you throw out there. I don't really see a glaring weakness anywhere with Dallas and that is why the Green Bay game so frustrating." What do you think they need to do to get over that hump to achieve the consistency that everybody is wanting to see out of them? "Understand that they have to match the intensity every week of the opponent that they are going to play. It can't just be when it is a division rival on the road. You wonder what their mindset was taking the field that day. Was that game more important to Green Bay then it was to Dallas? Being able to put your emotions in check and live in a week to week and game to game scenario as opposed to thinking hey, we're pretty good we've played well over the last four weeks. That means nothing once that game's over. That means nothing and that is one of the things that fans don't realize. When you play in the NFL you don't get to enjoy your victories very much but the losses tear your heart out. So its a tough business to be around. We were motivated in my era mainly by not wanting to win as much as it was you were trying to avoid that sickening feeling when you lost was our key motivation." A lot of people believe that Jason Garrett is the head coach in waiting for the Cowboys. You know him better than a lot of people who comment about him. Do you see him as the next coach of the Dallas Cowboys? "I definitely see him as a head coach in the NFL in the future whether he has that opportunity with Dallas or not I'm not sure. Everything that was done a couple of years ago with his contract you would think that was something that would be possible. He is the highest paid coordinator and Jerry made it very, very easy to make the decision to stay in Dallas. I think it would be a natural progression if there were a change that Jason would be your guy. But what happens if all of a sudden that Dallas is playing very, very well and there is no reason to make that change and there is another opportunity that comes along that Jason Garrett thinks is too good to turn down? When he went to Baltimore, when he visited Atlanta I think that those were probably scenarios that weren't as appealing being in Dallas at that time was. Jason made the comment that he felt that there was unfinished business here with the Cowboys. They haven't done anything comparable to what they did after they had that loss to the Giants in the playoffs that year so I still think you would still hear Jason Garrett say there is unfinished business here with Dallas." I think maybe Jason Garrett gets a little bit of a bad rap and the Dallas media is notoriously hard on the entire organization when they aren't winning Super Bowls. "Yeah, they tend to ride that emotional roller coaster quite a bit. The big thing is things weren't as great as they were in their minds after the Philadelphia win and things aren't as bad now after the Green Bay loss. It lies somewhere in between. Players and coaches try to keep it as consistent as they can. Not get too high with the highs and not get too low with the lows. But the media and the fans they swing back and forth on that pendulum all the time." What are your impressions of the new stadium? "I think it is fantastic, I really do. The architecture from the outside when you walk up is very cool. I love the big plazas at the ends. The uniqueness of the monitors, the roof, the panels. Jerry did the best of or the biggest at this time on a couple of occasions inside. Once you get in the building the finish out is phenomenal. The Jones family put a lot of thought into that facility and I don't think they left a stone unturned. When you're talking about a three million square foot facility and you can walk through it and see the finish out and the quality that exists on that size of a building it is absolutely incredible. I'm completely blown away by it." Great interview, him and Troy were my favorites during the glory days of the 90's...miss them, but hoperfully there coming back soon. John Madden always called him "Moose", and it still lives on today, though it may be something that rhymes with it. Good job scoring a Moose interview. And good questions. Tony Romo Getting a New Image?